In The Brisket Book: A Love Story with Recipes, author Stephanie Pierson writes, “Some foods will improve your meal, your mood, your day, your buttered noodles. Brisket will improve your life.” Brisket has been a standard at my mom’s house for Jewish holidays. And most good barbecue joints also have a tasty brisket. These are on different ends of the brisket spectrum, but both have a tender, savory, irresistible quality in common. Having just had my mom’s brisket this week at lunch on the first day of Rosh Hashana, I thought it would be a good idea to have a look at brisket recipes that ReciFoto users have shared, starting of course, with my mom’s! I’ve made her recipe a bunch of times and it is always delicious, but it never comes out as good as hers. You may be asking yourself, what is brisket? According to Wikipedia: “Brisket is a cut of meat from the breast or lower chest of beef or veal. The beef brisket is one of the nine beef primal cuts, though the precise definition of the cut differs internationally.” So, brisket is what you make of it. 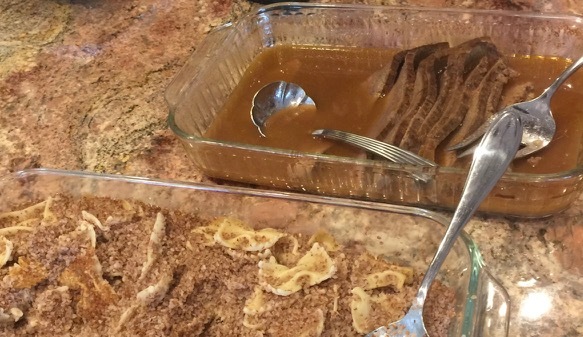 How about sharing your family’s recipe for brisket on ReciFoto? If you are getting this newsletter, it means you have registered for ReciFoto, either the website or the app. Many of you have already updated your ReciFoto app! That’s great if you have, and we hope you’ll consider upgrading to ReciFoto Plus, especially now that we’ve reduced the price to just $0.99. ReciFoto Plus allows you to save other users’ recipes to your Collection for easy access later. Another great feature of ReciFoto Plus is that you can make private notes on recipes that are visible only to you. And of course, we would be delighted if you invited your friends to download ReciFoto, too, and start sharing their recipes. Kasha Varnishkes (Kasha and Bowties) – It is practically obligatory to serve this with brisket, with the gravy from the brisket ladled on top!